This is the second year that Man Wah at the Mandarin Oriental has hosted Da Dong and its famous Peking duck (their promotion period runs from 14 to 22 April). I didn't manage to get a table the first time round so happily accepted my friend's invite this year. Da Dong was one of my favourite restaurants while living in Beijing with its beautiful presentation, lovely ambiance, attentive service, and of course the very tasty duck. I couldn't wait to test it out in Hong Kong and was happy to see that the ducks (and the servers!) were brought in from Beijing. The mini ones were absolutely adorable and taste-wise, it was a very refreshing dish that made you feel healthier at once. It did have a slightly more fermented tofu taste than the Beijing version though, which I didn't particularly enjoy. This was beautifully plated and our Da Dong server told us a very poetic story while sprinkling the icing sugar "snow" (of which I understood maybe 1/4 of it...really need to brush up on the mandarin skills...) However, it looked a lot better than it tasted. Flavour-wise, the pork ribs were perfect but the texture was just soooo tough. I felt like I was eating a stale piece of jerky. Chew chew chew. I was grateful to see the duck being rolled out as this was what I had been waiting for! Unfortunately, the duck was the big disappointment of the night. 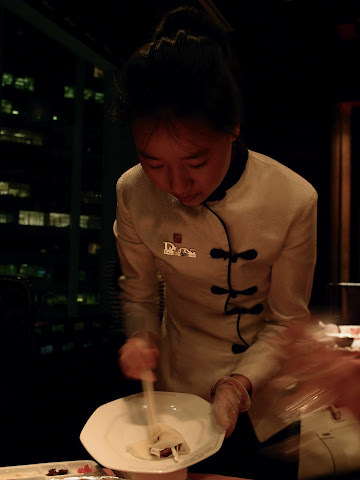 While I could overlook the appetizers being slightly sub-par, there is absolutely no excuse for Da Dong not to perfect their signature Peking duck before coming over. I get that Man Wah might not have the same cooking facilities to roast the duck as back home, but they've already been here one year and should've taken that into consideration. The flavour was lacking, the skin wasn't crisp, it was far oilier than in Beijing, the meat was tough and dry (especially the bottom layers) and not lean as they always advertise... Even the sweet sauce tasted slightly different. The only saving grace were the pancakes were which lovely and light. All in all, pretty unimpressive. I can't remember how much this cost or what exactly was in it but it was basically Chinese cabbage and a bunch of beans. Pretty pathetic looking if you ask me, and it was far too salty and oily. You would think they'd tone down the salt for Hong Kong palettes without us having to tell them "少油, 少盐". I've never been a big fan of abalone so I can't really comment, but the rice was pretty fragrant and I enjoyed the truffle sauce, although again it would've benefited from less oil. These noodles were a breath of fresh air after the oiliness of the preceding dishes. Simple, old-style Beijing noodles aren't too difficult to master but I'm glad they didn't over embellish and the noodles were perfectly light and springy. I thought this was way overpriced for the size of the dish. The pancakes were very odd in texture and you had to stuff the whole strip in your mouth as it was impossible to cut. They also came looking like bacon... The chocolate hawthorne to the left wasn't all that fun to eat either. However, the soya milk ice-cream was pretty interesting - it really tasted like soy milk without any additional sweetness, and it was a light, refreshing way to end a meal. All in all, I was pretty disappointed with the whole meal for the quality of the food and the exorbitant prices considering the size of each dish and how much cheaper it is back in Beijing (though I know I really shouldn't compare...) I just wasn't blown away by anything I had that night.